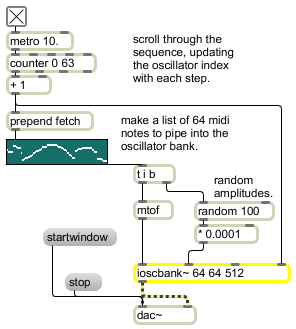 ioscbank~ is an interpolated oscillator bank with signal inputs to set oscillator frequency and magnitude. number-of-oscillators int opt The number of oscillators. The default is 1.
frequency-smoothing-factor (samples) int opt The number of samples across which frequency smoothing is done. amplitude-smoothing-factor (samples) int opt The number of samples across which amplitude smoothing is done. Performs the same function as float in any inlet (see signal and float messages). In left inlet: Sets the frequency of the oscillator whose index is currently referenced to the current floating-point value of the signal. The default value is 0. In 2nd inlet: Sets the magnitude (amplitude) of the oscillator whose index is currently referenced. In 3rd inlet: If framesync is enabled using the framesync 1 message, a signal in the range 0-1.0 sets the phase of the oscillator currently being referenced. In 4th inlet: Sets the index of the oscillator currently being referenced. clear The word clear sets the frequency of all oscillators to zero and zeros all amplitudes. In left inlet: The word copybuf, followed by a symbol that specifies a buffer, copies 4096 samples from the buffer into the ioscbank~ object's internal wavetable. An optional second integer argument specifies the position in the buffer at which samples are loaded (offset). The word framesync, followed by a non-zero number, enables frame synchronous operation. When frame synchronous operation is enabled, a given index's values will only change or begin their interpolated ramps to the next value when the index input signal is 0 (or once per n sample frame). Otherwise, a given index's values will change or begin their interpolated ramps to the next value when the index input signal is equal to that index. The default is off. The word freqsmooth, followed by a number, sets the number of samples across which frequency smoothing is done. The default is 1 (no smoothing). The word magsmooth, followed by a number, sets the number of samples across which magnitude (amplitude) smoothing is done on an oscillator. The default is 0 (no amplitude smoothing). The word set, followed by pairs of floating-point values, sets the frequency and amplitude of an oscillator in the oscillator bank. A list of n pairs will set the first n oscillators in the ioscbank~ object and zero the amplitude of all others. signal Performs the same function(s) as a float corresponding to each inlet. silence The word silence zeros the amplitude of all the oscillators. The word size, followed by a number, sets the number of oscillators. The default is 64.
signal: A waveform consisting of the sum of the specified frequencies and amplitudes.